Connoisseurs in the safari industry are calling the Linyanti ecosystem the new big thing in African safaris and many consider the area to be one of the top game viewing areas in Africa. But why is this area only now coming to the fore as a wildlife destination and what is it that makes it such an attraction? The answer to the first part of the question lies in the Botswana government's policy of granting private concessions outside the national parks and game reserves to trophy hunting companies but to get an overall picture we need to start at the water source itself. The Cuando River rises on the central plateau of Angola and flows south forming the border with Zambia before entering Namibia through the Caprivi Strip. A little further south the River forms the boundary between Botswana and Namibia and it is here where it widens into an area of swamp known as Linyanti. The waterway takes a 90° turn and begins to flow in a north-easterly direction eventually ending up on the Chobe floodplains where it meets the Zambezi River. The river once flowed into the great Lake that characterised this area thousands of years ago and of which the Okavango is a remnant. Tectonic movement blocked the flow of the Kwando into the lake, and the area we now know as the Linyanti Swamp was formed. 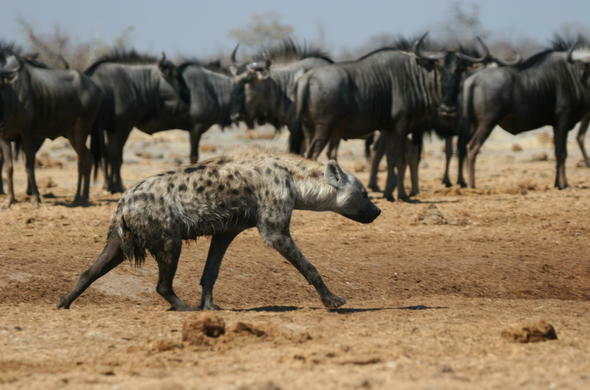 The wildlife of the region was described by the first explorers as prolific, bringing many hunters to share in the bounty over time and the Botswana tourism market over the past 50 years has been dictated by trophy hunting concessions. It is only in recent years that photographic safaris have become the dominant force. The areas outside of the game reserves and national parks were mostly designated hunting areas, with concessions granted by the government to the hunting companies. In the past 15 years photographic tourism in Botswana has taken off in leaps and bounds with luxury lodges set up to cater for this boom. Photographic safari companies saw the potential of tendering for these concessions and stopped hunting, but at first the animals were very skittish due to the years of been hunted. As the seasons progressed the animals relaxed and many of the areas returned to former glories. The Kwando and Linyanti areas are cases in point and over the past few years have become two of the most prolific wildlife viewing concessions in Africa. With no hunting having taken place for many years the animals relaxed and many that have avoided the areas in the past have returned, to such an extent that the Chobe River can no longer be considered the only elephant kingdom of Africa. During the dry season tens of thousands of elephants pass through the Linyanti ecosystem in search of water and the predator population has increased tenfold with many people regarding this northern waterway is the best predator viewing in Botswana.